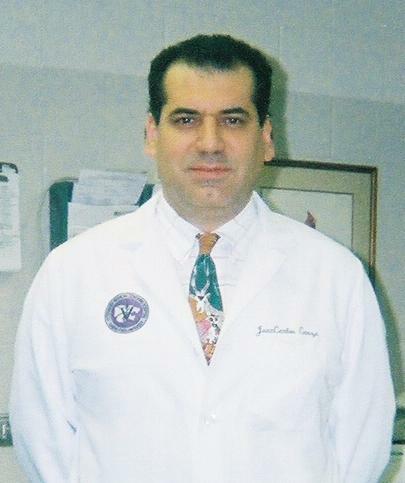 Dr. JuanCarlos Garza has been a veterinarian since 1988 when he graduated from Centro de Estudios Universitarios in Monterrey, Nuevo Leon, Mexico where he grew up. Dr. Garza came to live in Houston, Texas in 1990. In 1996, he enrolled in the ECFVG program, which is the Educational Commisssion for Foreign Veterinary Graduates. In 2004, he passed his last clinical study exam, and applied to Kansas State University for his final requirement through the ECFVG program. He was accepted and began his one year residency in June 2004. He graduated in May 2005, and obtained his license to practice veterinary medicine in Texas. Upon returning to Houston, he began working as a veterinary associate for an emergency clinic. During the time he was working at the emergency clinic, he also opened a mobile veterinary service known as Mobile Vet. Mobile Vet was opened from October 2005 through June 2007. In August 2007, he opened Garza Veterinary Clinic, which was located at 7116 Stuebner Airline Rd. in Houston, Texas. He incorporated his practice in 2009, and is now known as Garza Veterinary Clinic, Inc. In December of 2011 Dr. Garza moved his practice to 7702 N Shepherd Dr. Houston, TX 77088, where he currently practices veterinary medicine. He is a member of the American Veterinary Medical Association since 2005. As a hobby, Dr. Garza enjoys, reading, fishing and spending time with his wife, Bertha and their two children, Monica and JuanCarlos II. And can't leave out his other fur babies, his Great Danes, Lola and Sofi. It's with a heavy heart that we announce we lost Lola to cancer on September 13, 2016. RIP Lola.